This year’s will be Sam’s 4th Halloween. He didn’t pay any attention whatsoever the first two years, and last year, we headed to Blackpool illuminations so we could avoid Sam trying to get out of the house every time a trick or treater knocked on the door. 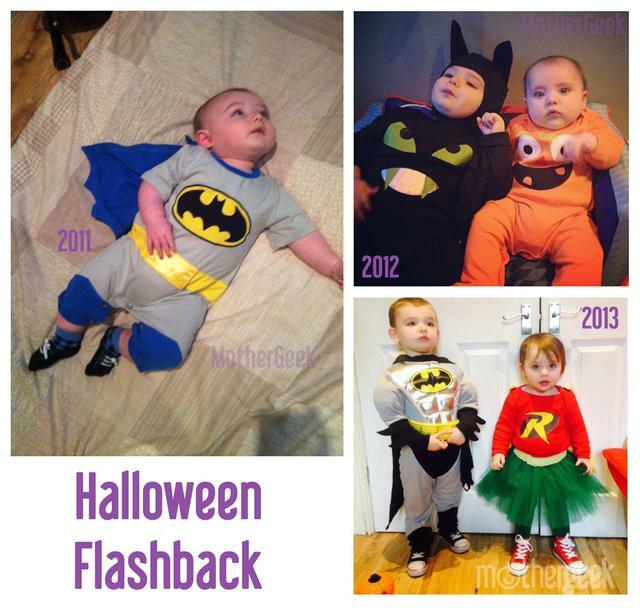 Last year, Sam was at nursery and they had a Halloween party there. He dressed up as Batman but hated his costume and was pretty miserable all day. Syd was dressed as Robyn and loved her outfit. We went to see the Illuminations in the evening, but it was freezing and pouring down, so we were all wet and miserable for the most part! Here’s how the kids looked in 2011-2013. This year, I have no idea what to do on Halloween. Sam tries to bolt every time the front door is opened. Our front door opens right onto a communal car park, so bolting is a huge worry at the best of times. When he’s greeted with “scary” costumes on Halloween, I am scared Sam might freak out hugely. At the same time, I don’t want to just skip Halloween altogether, as I know Syd will enjoy it. I think we might have to put our Merlin Annual Passes to good use, and head to Legoland Discovery Centre for Brick or Treat. Sam loves it there, and we go most weeks. I am hoping the Halloween Decorations won’t throw him too much. It’s half term though, so it may well be full to capacity, or too busy for him to handle.